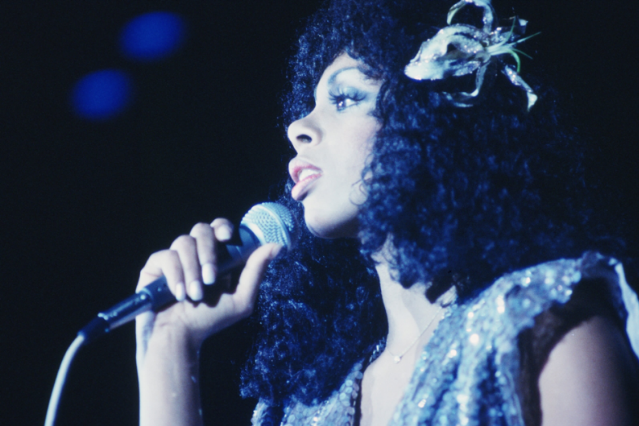 Summer’s early hits laid out the blueprint that a lot of women disco singers (and those singers’ producers) followed for a while, in the hopes of getting the same effect: strings, mist, a few words repeated again and again, and a version of sexiness that was all about theatrical orgasms. Not all of her early disciples were quite as gifted at singing as Summer, but some of them, like Andrea True, managed to be even more blatantly bedroom-eyed. For at least a few years, as far as the general public was concerned, “disco” meant “music that sounds like Donna Summer.” The bizarre 1980 sci-fi film The Apple involves an evil entertainment conglomerate whose tools of mind control are disco stars. In one scene, their star Pandi seduces the hapless hero with this ridiculous song and some bed-based choreography that has to be seen to be believed; its tune and arrangement are lifted wholesale from Summer’s album cut “Wasted,” from 1976’s A Love Trilogy. One of the biggest European club hits of the period when the continent first discovered house music involves a monomaniacal synthesizer riff that slows, then stops, as a woman makes increasingly vehement orgasmic noises. It’s striking for sure, but if you inverted the instrumental part of “I Feel Love” and dropped Summer’s moans from “Love to Love You Baby” on top of it, you’d end up with almost exactly the same thing.